You shouldn't throw everything in your fridge in bins, but this starter set will give you a leg up in the orderly direction. With these bins, you can pair like with like and prevent spills from rifling through your fridge shelves. (Definitely not talking from messy experience or anything.) Includes two bins, a condiment caddy, and an egg holder. 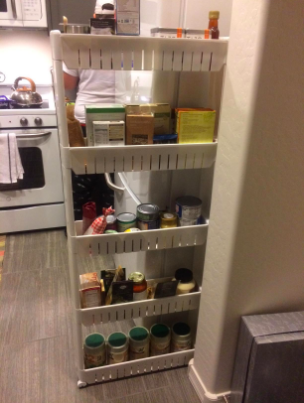 Promising review: "I have a double-door fridge and in order to fit larger bottles for juice and milk on a shelf, I have to move a shelf up, which creates a very narrow shelf. It was very hard to find things to go on this shelf. With the egg crate and low-profile bin, I was able to create almost a drawer-like setup where I could put yogurt and eggs and just slide out the tray without having to dig to the back." —Katie L.
2. Consider buying another sturdy egg holder so you can easily stack the container without crushing your eggs and quiche dreams. Get it from Amazon for $15.99 (21 eggs). 3. Prevent your LaCroix habit from disrupting your appliance's newfound order with a can dispenser. 4. Easily wipe up spills without disrupting everything in your fridge by putting in some cheap shelf liners you can pull out and rinse. Get a pack of four from Amazon for $7.99+ (available in several sizes). If you prefer to DIY, check out a tutorial with dollar store placemats on One Thing By Jillee. Or, use press-and-seal plastic wrap to create a temporary barrier on fridge surfaces. Learn more about that on The Virtuous Wife. 5. Prevent your crisper drawers from looking like a farmers market graveyard by lining them in produce life extenders that'll help keep your fruits and veggies fresher for longer. The longer those fruits and veggies stay alive, the less likely you'll have to clean up rotting produce! These liners are made of anti-mold, moisture-absorbing material and can be trimmed to size. Find even more help with our tricks to make your groceries last longer. 6. And keep fresh herbs in tip-top shape with an herb-saving container instead of finding them wilted in a produce bag a month later. 7. Swap the baking soda and used coffee grounds for an air-purifying bag to make your fridge smell like less of a landfill every time you open it. AND it'll take up zero shelf space. Get it from Amazon for $8.42. 8. Keep bacon strips (and other cold meats) safer for longer with this handy bacon keeper. It's also BPA-free and dishwasher-safe! While you're here, read up on how to store all your groceries. 9. Divvy up your bulk buys into normal-size portions — both for storage and meal prep — with a vacuum sealing system to make sure you finally eat all that food from your ambitious Costco haul. Get it from Amazon for $71.12. 10. 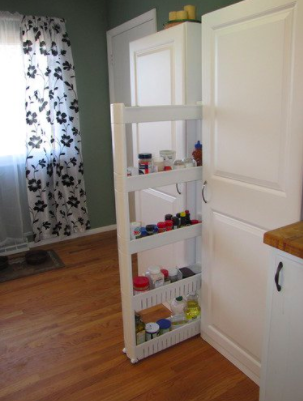 Bring stuff you'd normally shove to the back of the fridge within easy reach by placing bottles of condiments and more on lazy susans. Reaching for a bottle of ketchup to only topple over your hot sauce collection is never not devastating. 11. Learn what shouldn't be chilled so you won't have to sacrifice precious space to the not-so-cool items. Place onions, garlic, and shallots and hole-y paper bag instead. Get the deets on The Yummy Life. P.S. You can also store (whole, unwashed) mushrooms in a paper bag, stick the bag in the fridge, and they'll last for a week. 12. And stash the stuff that shouldn't be in the fridge nearby with this slim, slide-out caddy that's skinny but tall enough to place in the weird little space between your fridge and kitchen cabinets. Get it from Amazon for $39.92. 13. Spare some shelf space by lofting beer bottles with these magnetic strips. Get two strips (enough to hold six bottles) from Uncommon Goods for $38. 14. Or stack bev bottles (beer, soda, champagne, etc.,) easily on a simple rubber mat to prevent a wet disaster. 15. And keep opened bottles from making a boozy mess with this leak-proof wine saver that'll set firmly on a shelf. Note that this fits *most* wine bottles, but won't fit champagne bottles! 16. Give everything a name (and the date that it goes bad) with a label maker that feels very ~official~. Get it from Amazon for $17.89. Or, opt for a roll of 250 of these pre-typed labels that just need filling out under "Date" and Contents" from Amazon for $9.99. 17. Make better use of a tall shelf with this under-shelf basket to hold items that make for an awkward fit elsewhere. Get it from Jet for $17.59+ (available in three sizes). 18. Toss the old plastic containers stained with curry from your fave Thai takeout join (yum) and meal prep with these airtight stackable storage containers instead. Set includes 7 plastic food storage containers and 7 lids with a 100% leakproof guarantee. But don't listen to me about them! Check out our full review of these Rubbermaid Brilliance Food Storage Containers. Get the 14-piece set from Amazon for $24.99. 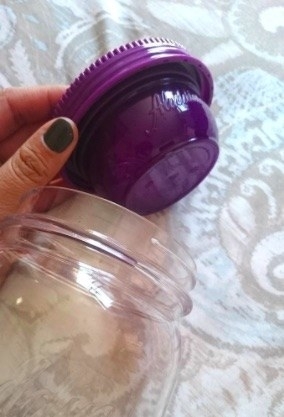 This one comes with a lid to hold your dressing. 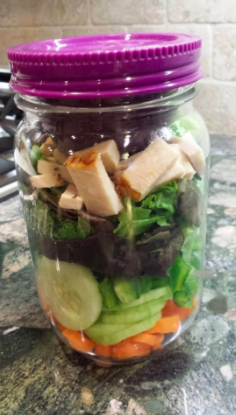 But, you can put a mason jar you already have to good use with our guide to packing a mason-jar salad. Oh, and when it's time to eat them, dump them in a bowl! I found that out the hard way when I packed a work lunch mason jar. 20. Encourage using up all the food you already have in your fridge with this magnetic dry-erase menu planner that'll stick to the front of a fridge door. So now maybe you won't have to watch the John Oliver segment on food waste on the reg since you'll actually eat stuff in your fridge before it expires!!! Or just watch it anyway. I've made myself watch it several times because 1.) I love him and 2.) I've totally had to clear out old food out of my fridge several times because I didn't store it properly or did some horrible planning. Prepared to be horrified about America's food waste problem, even if you don't care about its environmental effects!